Noon – Rest from Work (after Millet). Ask why humans need to sleep, and you may find many theories but few conclusions. The more we learn about sleep, the more we realize that much remains unanswered. Aristotle (384-322 BC) theorized it had to do with digestion; centuries later the cause was attributed to the pooling of blood in the head (Schenck 2007). Both research tools and our understanding of sleep have advanced greatly, but there are still a number of competing theories. That most amniotes (i.e., birds, reptiles, mammals) exhibit this behavior might make the sight of a sleeping body familiar to us, but if you consider that it involves fasting, a drop in core body temperature, temporary paralysis, and increased vulnerability, it is nonetheless strange. “Most people do not seem … curious or concerned about this odd desire they have to close their eyes, lie down, and blank out for several hours every night … until something goes wrong…” (Schenck 2007). And for a behavior that requires no learning at all, there are quite a few ways it can. Sleep is one of the great primary behavioral motivators, alongside food and reproduction. Considered bluntly, regularly drifting into a state of unguarded defenselessness seems like the epitome of an evolutionary dead end. But as anyone with knee problems can tell you, evolution doesn’t have to be perfect, just adequate. For humans, sleeping at night (probably in groups) was successful more often than not. Most animals need sleep to survive and have developed strategies (e.g., crypsis and group vigilance) to combat some of its inherent dangers. We may not know why we evolved in a way that requires regular and sustained rest, but we do know that inadequate sleep results in poor health: to go without it can have lasting negative health effects and eventually results in death. 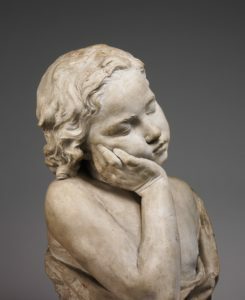 Sleeping Boy, by Philippe-Laurent Roland. One characteristic of sleep that has become increasingly apparent (and perhaps comforting) is that how we sleep is indicative of our connection to this planet’s diurnal cycles. Too important to be left to our conscious decisions, our bodies have evolved to react to the rising and setting of the sun with a chemical reaction stronger than our willpower, resulting in an irresistible urge to sleep. However, when we remove ourselves from regular exposure to daylight (even an electric equivalent), this hormonal reaction is disrupted. The result is poorer sleep quality, leading to overall poorer health and cognitive function, which can result in lowered productivity. Those living in the U.S. now spend upwards of 90% of their time indoors, making the thoughtful design of our built environment not just for good business but good for occupant health. 1 Foster, R. (2013) . The neuroscience of sleep. TEDGlobal 2013. Mammals may have started out as small, nocturnal animals scurrying beneath the footfalls of giant reptiles, but we naked apes are decidedly ill-equipped to function in darkness. Unlike other terrestrial mammals, whose amount of daily sleep seems to correlate with diet (Davis, in review), the reason adult humans seem to perform best with 7-8 hours of sleep per night is not entirely clear. Our bodies have evolved to feel energized with light (i.e., circadian effective light) and drowsy with its absence, helping us ease into sleep. While there is still some debate about the exact pathway, a simple explanation is that light enters the retina and stimulates the intrinsically photosensitive retinal ganglion cells (ipRGCs) in the retina, a process called phototransduction. The ipRGCs then stimulate a region of the brain called the suprachiasmatic nucleus (SCN), which is located in the hypothalamus. This in turn triggers the pineal gland, a pine cone-shaped structure within the brain. The pineal gland regulates the production of melatonin: not a “sleep potion” but a hormone released in reaction to darkness and a signal to the body that it is time to sleep. Mounting evidence explains how the “…peaks and valleys of melatonin over time are important for matching the body’s circadian rhythm to the external cycle of light and darkness” (NIH 2017). Let us take a moment to consider the evolutionary path that may resulted in this process (see sidebar). Our bodies (under direction from the brain) are entrained to this pattern of light and dark, rest and wakefulness, and no amount of acclimatization, ginger tea, dietary supplements, or caffeine is going to change that. Of course, nothing in nature is perfect, and sleep problems stemming from chemical imbalances do occur. Along with the production of melatonin, the brain must produce neurotransmitters2 that keep the body still while asleep -effectively paralyzing the sleeper and preventing the acting out of any dreams, for while the body may be still, the brain’s emotional-processing center, the amygdala, is aroused. When this mechanism is “faulty” people may find themselves in some unusual positions. Curiously, people who are exposed to cycles of light and dark typical of higher latitudes (i.e., above the Arctic and Antarctic circle, where days often consist of 24 hours of sunlight or darkness) and who do not try to adhere to an artificially imposed clock schedule, tend to freecycle their sleep every 24.2 hours, slightly out of sync with the typical day on this planet (Schenck 2007). Non-human animals have adapted differently, and may use different strategies. Nocturnal animals are one obvious category. High latitude animals may also have different cycles. One study suggests that reindeer living above the Arctic Circle are able to “turn off” their circadian clock during winter, although it is not clear exactly how this works, or how this behavior would affect other behaviors such as annual breeding cycles (Ghose, 2010). What we would consider extreme sleep strategies are exemplified by marine mammals, who spend a majority of their lives in the water but still breathe like their terrestrial ancestors. Adult female southern elephant seals and juveniles rest on a beach in Península Valdés, Argentina. 2 Both metabotropic GABAB and ionotropic GABAA/glycine neurotransmitters work in sync to paralyze the muscles during periods of REM sleep and release them afterwards (Brooks and Peever, 2012). 3 Even on land, marine mammals are apneustic breathers. An apneustic breathing pattern is one in which “several rapid breaths alternate with a prolonged breath-holding period” (Morrissey, Sumich, and Pinkard-Meier, 2016). 4 Specifically in small studies of captive pilot whales, bottlenose dolphins, harbor porpoises, Amazonian river dolphins, and beluga whales. 5 This pattern of behavior, seen in elephant seals (which can weigh over 4 tons), has been likened to a “falling leaf” (Mitani et al. 2010) and may be the only time seals and an an e.e. cummings poem appear in the same thought. What a mysterious existence to ponder: the dark, massive form of the animal’s body gliding down a pitch-black water column. 6 Researchers working on the problem of long-duration space travel and suspended animation are also studying the seals’ ability to spend several weeks in a resting mode without suffering loss of muscle. Sun, seasons, and tides drove most of the world’s schedules before widespread and inexpensive lighting. Thanks to a number of historians piecing together the various flashpoints and slow burns of the innovation of controlled artificial lighting, we can now talk about the Promethean progression that begins with flames, rendered animal byproducts, and gas pipes, and has brought us the Edison bulb, LEDs, and neon cities that never sleep. With the advent of artificial light and other advances that allow us to remain inside (e.g., air conditioning, phones, the Internet), in many places available daylight no longer shapes the schedules of human activities. By 1700 the major cities of Europe were illuminated at night, aiding in the creation and popular acceptance of nighttime activities (i.e., nocturnalization) such as evening balls, late night taverns, and coffee houses (Koslofsky 2011). The (strange) discovery in the early 1700s of the bright, white light created during the combustion of spermaceti7 further extended (and improved) the hours we could spend reading or working at night. Within 200 years the electric light bulb8 replaced spermaceti, kerosene, and gas lighting, and introduced to the world inexpensive, widespread illumination (Johnson 2014). Productivity increased with the creation of night shifts, and more places (from theaters to ballparks) could operate safely and effectively in the dark. This along with air conditioning and electric power in the home changed the way we lived, including how we slept. Historians like Roger Ekirch point out that people used to divide their sleep into two parts: turning-in once it became dark then waking after about four hours for various activities, then returning to sleep until dawn (this may be why some people still find it difficult to sleep through the entire night) (Johnson 2014). In the last 300 years “divided sleep” became less and less common in urban areas as they began lighting streets, cities, and homes, allowing people to stay up and go out later (Koslofsky 2011). Indeed, this idea has nearly been lost as we have moved away from natural cycles to using clocks that impose an artificially structured schedule. Furthermore, we are now realizing that not only are these extended or unnatural hours detrimental to our health, so is the light source itself. A light-filled meeting room in an office. All of this brings us to now: living on a schedule mostly independent of sun or season but occupying bodies that are not. Biophilic design promotes the use of natural daylight in buildings to lower energy demand from artificial lighting and also to contribute to a healthier environment for occupants. Access to daylight plays a role in keeping office workers alert during the day and able to sleep better at night (Figuerio et al. 2017) and may also play a role in reducing hospital patients’ average length of stay. Increasingly architectural firms such as ZGF, Atelier 10, and Glumac are incorporating this understanding into their designs and also following building standards like LEED and WELL, both include daylighting and circadian lighting credits. Limiting exposure to blue light at night. Not to be overlooked is the importance of low light and darkness in the evenings and while sleeping. LEED standards for Dark Sky compliance have benefits that extend beyond energy efficiency and wildlife conservation. Exposure to light (especially blue light from electronic screens) can be damaging to our circadian system just as inadequate exposure to morning light. A relatively simple experiment shows that an absence of electric light at night (combined with higher levels of daylight sunlight) affects our melatonin levels even over a short period of time. Although questions about sleep and sleep quality have not all been answered, we are beginning to see how adequate exposure to circadian effective light during the day (especially in the morning) has a measurable effect on our health, sleep quality, and job performance. The design of our buildings (especially offices) has potential benefits. Break areas can maximize daylight with window design and orientation, considered alongside furniture, blinds, and glare control. Desks in open areas can have low or transparent partitions, especially parallel to the source of daylight. When access to sunlight is not adequate, designers must create and integrate artificial circadian lighting systems into their plans (although this does affect the EUI of the building). Tunable (adjustable) overhead and task lighting can mimic natural changes in daylight, providing “blue” light in the mornings and softer “yellow” light after lunch, helping occupants ease into a low-light pattern at night. As with modern medicine, we have largely removed ourselves from natural selection and therefore sometimes do not see connections to our evolution and physiology, like why we tend to prefer “prospect views” from a protected perch, or why we have involuntary reactions like yawning, fainting, and the mammalian dive response. While we do not have to return to a time of tallow candles or campfires to be healthy, we may find that understanding our remarkable evolution and acknowledging its continuing effect on our conscious and subconscious selves results in a built environment more in tune with our body’s needs. 7 An oily substance in the head of a sperm whale; mature adult whales can carry over 500 gallons. The spermaceti organ is thought to act as an acoustical lens for focusing sound pulses used in echolocation. 8 The light bulb, a collective effort generally credited to Thomas Edison, who, as professor of circadian neuroscience Russell Foster points out, believed sleep to be not just a waste of time but a relic of a less-evolved time. 1. Brooks, P.L., and Peever, J.H. (2012). Identification of the Transmitter and Receptor Mechanisms Responsible for REM Sleep Paralysis. Journal of Neuroscience, 32 (29) 9785-9795. 2. Davis R.W. (in review). Marine Mammals: Morphological and Physiological Adaptations for an Aquatic Life. Springer. 4. Figueiro, M.G. et al. (2017). The impact of daytime light exposures on sleep and mood in office workers. Sleep Health: Journal of the National Sleep Foundation. Vol. 3 (3), 204 – 215. 6. Kosflosky, C. (2012). Evening’s Empire: A History of the Night in Early Modern Europe. 8. Mitani, Y., et al. (2010). Three-dimensional resting behaviour of northern elephant seals: drifting like a falling leaf. Biol. Lett. 2010 6 163-166; Published 12 March 2010. 9. Morrissey, J., Sumich, J., and Pinkard-Meier, D.R. (2016). Introduction to the Biology of Marine Life. Jones & Bartlett Learning; 11 ed. 11. Schenck, C.H. (2007). Sleep: A Groundbreaking Guide to the Mysteries, the Problems, and the Solutions. London: Penguin. Noon – Rest from Work, by Vincet van Gogh/Public Domain, Wikimedia Commons. Sleeping Boy, by Philippe-Laurent Roland/Universal Public Domain, Wikimedia Commons. Adult female southern elephant seals and juveniles, photo by Author, 2012. Hunting of Sperm Whale/Public Domain, Wikimedia. Limiting light at night, courtesy Clint Mckoy/Unsplash. is a research analyst at Terrapin and has a background in architecture and field research. She completed her master’s and doctoral degrees at Texas A&M University and her bachelor's at Washington University in St. Louis. Her interests include energy efficiency and occupant comfort in extreme environments and bio-inspired innovation.